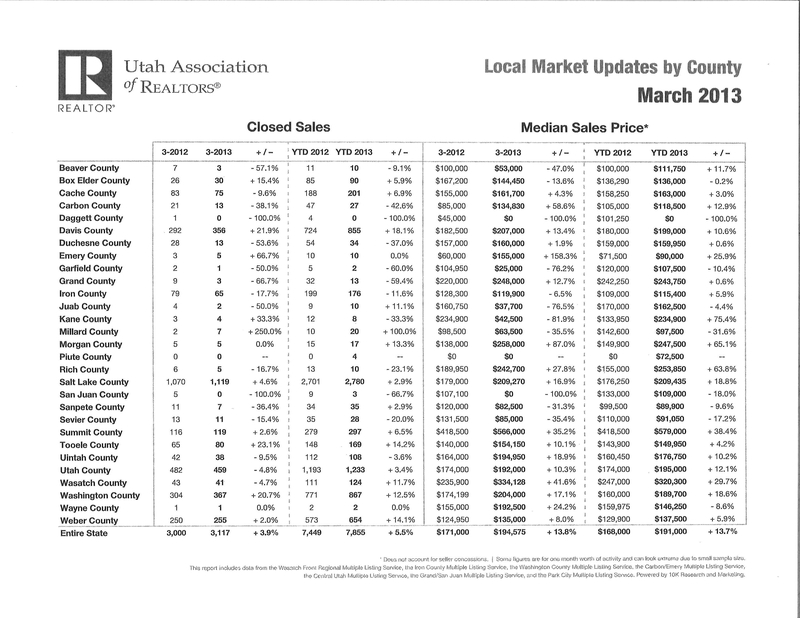 According to the attached recent Utah Association of REALTORS (UAR) “Local Market Updates by County,” IronCounty sales year to date are down 11.6% as compared to the same time last year. I believe this may be due to the lack of inventory in this market rather than to the lack of buyer. With the decrease in inventory, sometimes nice homes that are priced right will attract more than one buyer. Even though there are several buyers wanting a home, only one wins. Therefore, only one sale occurs and one closing. The remaining buyers must start their search for the right home again. If there had been several similar homes available, there would have been several closings rather than just one. There are serious buyers and investors in this real estate market. According to the same attached UAR Market Update for March 2013, the median price has risen year to date by 5.9% to $115,400 in IronCounty. The complete report for all counties is attached for your information. It takes the UAR 2 to 3 months to complete the report. My next Market Update will include April’s UAR report. Some sellers are taking their homes off the market hoping the prices will rise. We do not know what the future will bring, so that plan may backfire. It is not possible to accurately predict the low and the high of the market. It is my opinion that it is a good time to sell while inventory and interest rates are down and while buyers and investors are buying. even had a few buyers willing to pay above appraisal to get the home they want. Not all buyers have extra cash to put down in order to do that. Buyers in our market still want a bargain, but some are realizing there is a shift occurring from the strong buyers’ market of the past few years to a steady market due to supply and demand. I believe that if sellers want to sell, they should do so now while buyers want to buy. Buyers are attracted when prices and interest rates work together to make an affordable monthly payment and when the home shows well. If either prices or interest rates go up, it becomes difficult for buyers in this market to qualify. California and Nevada real estate markets seem to have improved which is good. Buyers are looking for bargains when they come here from out of state to buy. They go online and find the best prices per square foot. Then they tour the homes, and they choose their home from those that show the best and have the most upgrades. What are the 4 MUSTS to sell a home or property in this real estate market? 1. Aggressive marketing by the Naisbitt-Bagley Team. Ask to see our successful marketing plan that works! 2. Competitive pricing with current market. Ask for a free valuation, so your home or property will attract the action in this market. 3. Show-perfect staging. Ask for free consultation to show case your home or property. 4. Be ready to show your home when a buyer is ready to look for maximum exposure to buyers. Buyers on tight schedules rule out houses not available for showings. What about the buyers in this market? Some buyers are discouraged by the lack of inventory and get disappointed when another buyer outbids them for a home. I strongly recommend that buyers stick to it and do not give up. The Naisbitt-Bagley Team has helped many buyers find happy homes and they are grateful they were patient and successful. What are the 4 MUSTS for buyers to buy a home or property in this real estate market? list of homes for sale. Ask the Naisbitt-Bagley Team for yours. It is free. 2. Automatic emails of the new listings as they come on the market and of price reductions as they hit the MLS. Ask the Naisbitt-Bagley Team to set up your free emails. 3. Tour of homes. The Naisbitt-Bagley Team can set up and help with your tour of every home thanks to the MLS which saves you time. 4. Negotiating skills and contract skills are a must. You will want the experienced and highly trained Naisbitt-Bagley Team to write and negotiate your offer. Homes in all price ranges are selling especially homes under $150,000. Lots are selling and there is new construction. Existing homes are the big sellers. Commercial and acreage are still slow sellers but do happen. For your free consultation and answers to concerns and questions, please contact the Naisbitt- Bagley Team at 435-865-1019 at ERARealtyCenter or text 435-559-7772 today. You can also email naisbitt@inxsnet.com. Most of the Naisbitt-Bagley Team clients come from referrals. Please let us know if you know of anyone with real estate needs whether buying, selling, or investing. We will work hard to help them achieve success! Enjoy a Beautiful Memorial Day! Memory Lane can be a sad place to travel; but right now my mind is pondering precious memories if Mom and Dad. What treasures! It has been difficult for me to have them both gone, and I am most grateful for their lives, time with me, and especially their wonderful example. I have spent much time with them in my heart today. The feelings of love are deep. I hope they know how much I love them both and how very grateful I am for them every day of my life. What a joy to honor them this day and eternally! I have spent time today being grateful for my grandparents as well as all of my ancestors. What a blessing to have so many before me to love and cherish and that have prepares the way for me. I am truly blessed and grateful for my heritage. I am very grateful for all of those who have served this great country. I love America and am incredibly grateful for every freedom we enjoy here. My thoughts move forward to my grandchildren and children and posterity. What blessings God bestows upon all of us! Please enough a beautiful Memorial Day! Happy Mother’s Day to All Women Everywhere! I wish all women everywhere a very Happy Mother’s Day whether you are blessed with children of your own or whether you are a positive influence for good in the lives of others or both! I remember as a teenager in our Church Young Women’s class, our teacher, Ardeth Kapp, was very sad that she didn’t have children of her own. Yet she had an amazing and positive effect on all of us in her class for 6 years and continues to care today. She made a difference in every one of our lives. She went on to be Young Women’s General President for the entire Church of Jesus Christ of Latter Day Saints and had an influence for good for thousands of Young Women all over the world. Her books have inspired people of all ages. One of my favorites is, You Are Better Than You Think You Are. She is an amazing woman and I wish her Happy Mothers Day and send loving wishes and thanks with all my heart. My own dear mother has passed away, but she was the best and still is. They don’t come any better! I hope to be worthy to be with Mom and Dad and all my family, friends and loved ones for all eternity! I know Dads who deserve a Happy Mother’s Day also! Therefore, let me expand my warm wishes for a Happy Mother’s Day to all! The Iron County Board of REALTORs’ Real Estate Convention ended today after 12 hours of excellent education, great food, information, and professional company! The broker at ERA Realty Center taught the agents to “sharpen the saw,” which he said meant to take time out to learn and grow to be better prepared to do a superior job for clients. Those who took advantage of this opportunity to attend the ICBOR Convention will excel in their career and have advanced knowledge of real estate contracts, water rights, foreclosures, short sales, death and estate planning as it relates to real estate sales, the Code of Ethics and more. The training was valuable, timely and important in reaching our goals of professionally serving the public. I want to especially thank Bob Fulton and all of those who made this excellent opportunity available to agents in our area. We certainly got the chance to “sharpen” our real estate skills to better serve our clients whether they want to buy or sell real estate. Where Did All The Homes For Sale in Cedar City Go? Cedar City Real Estate inventory is down, and sales prices have risen just a little. This seems to be causing a shift in the real estate market in trhe Cedar City, UT, area. Where did all the homes for sale go? Some have been purchased by homeowners and investors. Some have been taken off the market by sellers who have noticed that prices are going up. They are hoping they will go up even more. Last week I showed homes to buyers. The homes would be active and for sale and then suddenly would go under contract before we even had a chance to look at the home and write up the offer. Friday and Saturday, however, 2 homes were simply taken off the market even as I had buyers interested in them. We need homes for sale while the buyers are here wanting to purchase them. There are no guarantees in this real estate market. Elevators go up and down and so do real estate markets. There is no qay to know the next few months. There is no crystal ball. I believe that now is a good time to buy and sell. Please call the Naisbitt-Bagley team for your own free consultation and market overview to help you decide how to make your real estate dreams come true. This team has the experience and knowledge to help you get the results you want in today’s world of real estate. That’s the Naisbitt-Bagley Team at ERA Realty Center at 435-865-1019 or email naisbitt@infowest.com.